Who is Bloodshot? Vin Diesel releases image of himself as Bloodshot...well kind of. Bloodshot is a popular character in the Valiant Comics Universe. Bloodshot was launched in 1992 during the height of Valiant's popularity and immediately became a hit. 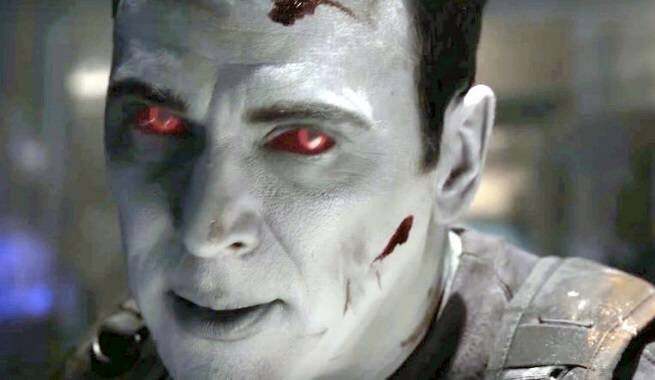 Bloodshot will appear in the live action film Ninjak vs. the Valiant Universe a web based series and be played by actor Jason David Frank. A Bloodshot film is also in the works by SONY. Actor Vin Diesel has signed on to play Bloodshot in the film. Fun Fact: The Valiant character of Rai has the same blood nanonites in his blood has Bloodshot which gives him access to a similar power set and some of Bloodshot's memories. Rai takes place after Bloodshot and its suggested that the warriors known as Rai were all created to honor bloodshot. Bloodshot is a heavily technologically enhanced soldier that has been imbued with special nanites in his blood that give him access to a wide ranging array of powers. Bloodshot comes from a super soldier project called the Rising Spirit program. The Rising Spirit program had the goal of creating the ultimate soldier and its history goes back prior to WWII. The first soldiers from Rising Spirit were crudely enhanced foot soldiers but overtime they developed greater levels of technology. This technology was supported for decades and given a large budget that kept the program moving toward its end goal. Over a course of decades the Bloodshot program is developed that includes nano machines and an advanced A.I. A soldier is taken and has his memories wiped away. He is injected with the Bloodshot nanites and given an advanced A.I. This technology allows hi body to heal quickly, shape and alter his mass, and interface with technology. He is also downloaded with a variety of false memories meant to motivate him on each particular mission he is sent on by Project Rising Spirit. Bloodshot goes AWOL on a mission when a scientist defector named Dr. Emmanuel Kuretich from Rising Spirit attempts to download Bloodshot's memory. Dr. Kuretich hopes he can expose Project Rising Spirits missions of kidnapping children with rare powers called "psiots". The mission download inadverdently triggers the false memory files all at once causing him to go beserk. Bloodshot realizes that he has been downloaded with fake memories and begins to seek out his true identity. Kuretich tells Bloodshot about Project Rising Spirit facility and there defeats the cyborg guards Chainsaw and Gamma. Inside the facility he finds a placed the Nursery which is a jail and experimental area for Psiot children. Bloodshot frees the children but finds no signs of his true identity. He confronts Kuretich and the man he works for Toyo Harada of the Harbinger Foundation to see why they sent him there and where he can find his real identity. Rising Spirit had installed a special Harada Protocol into Bloodshot that forces him to attack him. Harada is one Rising Spirit's main competitors. The warriors battle in which Harada is badly wounded and Bloodshot has depleted his nanites. Harada manages to capture Bloodshot and begins to experiment on him in an attempt to learn the secrets of his technology. He is freed by an elite group called the H.A.R.D. Corps who work for Project Rising Sun. The group gives Bloodshot a hard copy of the P.R.S. file on his true identity and he begins to work with the team. Bloodshot does many missions with the H.A.R.D. Corps which includes a mission with Prodigal and the Immortal Warrior. A Bloodshot film is also in the works by SONY. Deadline reported that actor Jered Leto was approached about playing Bloodshot in the film. However Leto was not hired in the end. The part was taken up by actor Vin Diesel. Vin Diesel will play the Angelo Mortalli version of Bloodshot that is a mob hitman that is experimented on with technology of Project Rising Spirit to make him into the ultimate killing machine. The film is said to take heavy influence from the original Robocop films and will carry an R rating. There are currently 5 Valiant Films in the SONY deal with the first being Harbinger. The 2nd film is scheduled to be Bloodshot. Bloodshot is expected to begin filming in July in Prague, Czech Republic. Vin Diesel released the following picture on his Instagram to promote Bloodshot. This appears to be Angelo Mortalli before being injected with the Nano technology that will transform him into Bloodshot. There is a cover for Blootshot Salvation #12 that features Vin Diesel as Bloodshot. 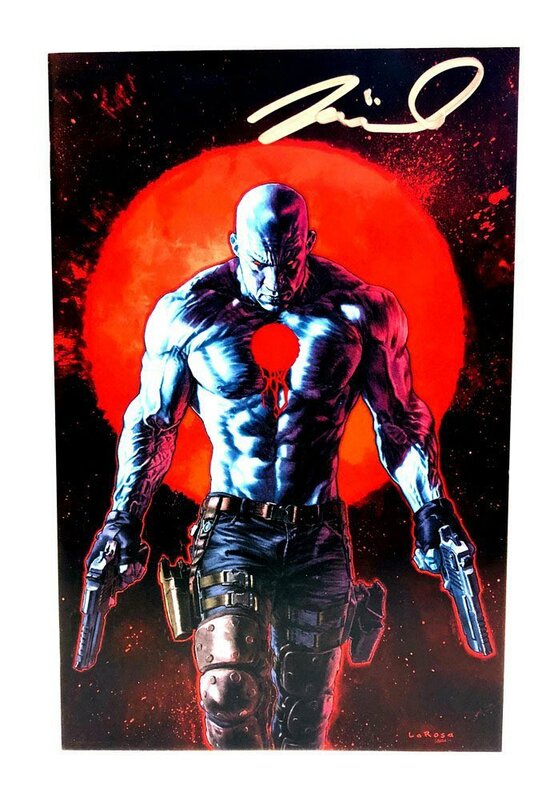 This gives fans some idea of what Vin Diesel will look like as Bloodshot. Vin Diesel shared this picture of himself as Bloodshot that was created by artist Bosslogic. This is not official just an artists rendering of how he thinks Vin Diesel will look as Blood Shot. Bloodshot will appear in the live action film Ninjak vs. the Valiant Universe a web based series and be played by actor Jason David Frank. Frank is most known for his role as Tommy the Green Ranger in the Power Ranger series.